You are very welcomed to join our weekly meetings, every Saturday at 3PM (local time) in the premises of the National Museum of Anthropology (MUNA) in San Salvador. The meetings are characterized by the informal exchange of material and information between our members. MUNA is located at Avenida Revolución, Col. San Benito, in front of the Centro Internacional de Ferias y Convenciones (CIFCO). It is the largest museum in El Salvador, with a history of more than 100 years and has an extensive collection of Pre-Columbian artifacts and ethnographic material. The Salvadorian philatelic gallery is also part of the museum. Auctions. We hold at least one auction during the year, giving our members the opportunity to buy rare stamps, covers, etc. EXFILNA. Occasionally, we organize the National Philatelic Exhibition, EXFILNA (Exposición Filatelica Nacional) or a Stampshow to promote philately and add new members. Salvadorian Philatelist Day. In San Salvador, we celebrate every January 5th the Salvadorian Philatelist Day with activities such meetings, dinners, etc. 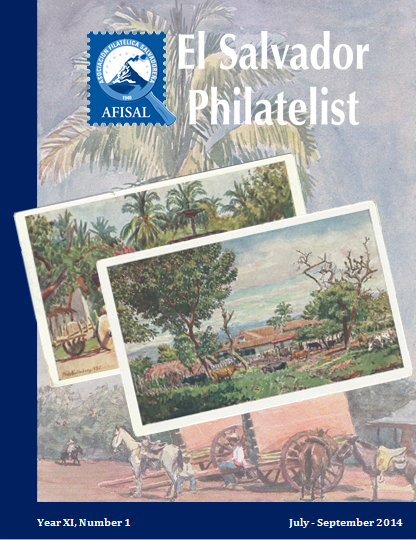 El Salvador Philatelist On-line. Our award-winning quarterly on-line journal is available in the Members section of this website. A sample issue is available for download . Auctions. Members abroad can place absent bids for the auctions held in San Salvador. New Issues Service. Collectors interested in new issues from El Salvador will be able to obtain them from the Society at face value plus a commission for the service. 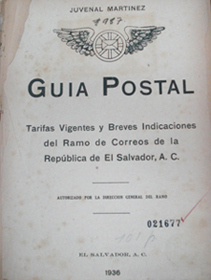 El Salvador Philately & Postal History Sources. A repository of information that includes a bibliography of Salvadorian philately articles and postal history documents, Postal Guides, etc. All of these services are available in the Members section of this website. El Salvador Album Pages. 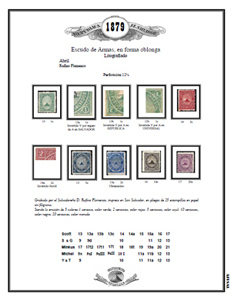 Downloadable album pages for Salvadorian stamps.